Based on Tom Clancy's bestseller, directed by John McTiernan (Die Hard) and starring Sean Connery and Alec Baldwin, The Hunt For Red October seethes with high-tech excitement and sweats with the tension of men who hold Doomsday in their hands. A new technologically-superior Soviet nuclear sub, the Red October, is heading for the U.S. coast under the command of Captain Marko Ramius (Connery). The American government thinks Ramius is planning to attack. 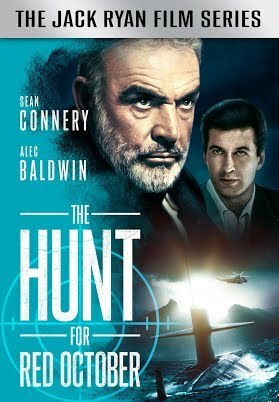 A lone CIA analyst (Baldwin) has a different idea: he thinks Ramius is planning to defect, but he has only a few hours to find him and prove it - because the entire Russion naval and air commands are trying to find him, too. The hunt is on!